Root, in red, of a C major chord ( Play (help·info)). Note that the root is doubled at the octave. In music theory, the concept of root is the idea that a chord can be represented and named by one of its notes. It is linked to harmonic thinking— the idea that vertical aggregates of notes can form a single unit, a chord. It is in this sense that one speaks of a "C chord" or a "chord on C"—a chord built from "C" and of which the note (or pitch) "C" is the root. When a chord is referred to in Classical music or popular music without a reference to what type of chord it is (either major or minor, in most cases), it is assumed a major triad, which for C contains the notes C, E and G. The root need not be the bass note, the lowest note of the chord: the concept of root is linked to that of the inversion of chords, which is derived from the notion of invertible counterpoint. In this concept, chords can be inverted while still retaining their root. In tertian harmonic theory, that is in a theory where chords can be considered stacks of third intervals (e.g. in common practice tonality), the root of a chord is the note on which the subsequent thirds are stacked. For instance, the root of a triad such as C Major is C, independently of the vertical order in which the three notes (C, E and G) are presented. A triad can be in three possible positions, a "root position" with the root in the bass (i.e., with the root as the lowest note, thus C, E, G or C, G, E, from lowest to highest notes), a first inversion, e.g. E, C, G or E, G, C (i.e., with the note which is a third interval above the root, E, as the lowest note) and a second inversion, e.g. G, C, E or G, E, C, in which the note that is a fifth interval above the root (G ) is the lowest note. Regardless of whether a chord is in root position or in an inversion, the root remains the same in all three cases. Four-note seventh chords have four possible positions. That is, the chord can be played with the root as the bass note, the note a third above the root as the bass note (first inversion), the note a fifth above the root as the bass note (second inversion), or the note a seventh above the root as the bass note (third inversion). Five-note ninth chords know five positions, etc., but the root position always is that of the stack of thirds, and the root is the lowest note of this stack (see also Factor (chord)). Determining chord root from inversion Play (help·info). "Revoicing inverted triads to root position". Although the safest way to recognize a chord’s root is, after having reduced the chord to close spacing, to rearrange it as a stack of thirds, there are shortcuts to this: in inverted triads, the root is directly above the interval of a fourth, in inverted sevenths, it is directly above the interval of a second. With chord types, such as chords with added sixths or chords over pedal points, more than one possible chordal analysis may be possible. For example, in a tonal piece of music, the notes C, E, G, A, sounded as a chord, could be analyzed as a C major sixth chord in root position (a major triad – C, E, G – with an added sixth – A – above the root) or as a first inversion A minor seventh chord (the A minor seventh chord contains the notes A, C, E and G, but in this example, the C note, the third of the A minor chord, is in the bass). Deciding which note is the root of this chord could be determined by considering context. If the chord spelled C, E, G, A occurs immediately before a D7 chord (spelled D, F♯, A, C), most theorists and musicians would consider the first chord a minor seventh chord in first inversion, because the progression ii7–V7 is a standard chord movement. The concept of root has been extended for the description of intervals of two notes: the interval can either be analyzed as formed from stacked thirds (with the inner notes missing): third, fifth, seventh, etc., (i.e., intervals corresponding to odd numerals), and its low note considered as the root; or as an inversion of the same: second (inversion of a seventh), fourth (inversion of a fifth), sixth (inversion of a third), etc., (intervals corresponding to even numerals) in which cases the upper note is the root. See Interval. Root position triads from C major scale Play (help·info). Chords in atonal music are often of indeterminate root, as are equal-interval chords and mixed-interval chords; such chords are often best characterized by their interval content. The first mentions of the relation of inversion between triads appears in Otto Sigfried Harnish’s Artis musicae (1608), which describes perfect triads in which the lower note of the fifth is expressed in its own position, and imperfect ones, in which the base (i.e., root) of the chord appears only higher. Johannes Lippius, in his Disputatio musica tertia (1610) and Synopsis musicae novae (1612), is the first to use the term "triad" (trias harmonica); he also uses the term "root" (radix), but in a slightly different meaning. Thomas Campion, A New Way of Making Fowre Parts in Conterpoint, London, ca. 1618, notes that when chords are in first inversions (sixths), the bass is not "...a true base,", which is implicitly a third lower. Campion’s "true base" is the root of the chord. Full recognition of the relationship between the triad and its inversions is generally credited to Jean-Philippe Rameau and his Traité d’harmonie (1722). Rameau was not the first to discover triadic inversion, but his main achievement is to have recognized the importance of the succession of roots (or of chords identified by their roots) for the construction of tonality (see below, Root progressions). The concept of root has some basis in the physical properties of harmonic sounds. When two notes or more notes from the harmonic series are played at the same time, people sometimes perceive the fundamental note of the series, even if that note is not present (see Missing fundamental). This property has been used in organ building for the production of low notes by resultant tones. Andreas Werckmeister’s Harmonologia (1702) describes the major triad in root position and in first inversion in terms of the harmonic series, but this description cannot be extended to the minor triad. Hindemith, who described the chromatic scale as resulting from "the juxtaposition of vibrating units in the proportions of the simple numbers from 1 to 6", i.e. from the intervals corresponding to harmonic partials 1 to 6, called the fundamental of this harmonic series the "root" of the scale. From this root, he then derived a series of notes in diminishing degree of relationship, which he called Series 1 and on which he built a system of composition. This system however has been criticized for being based generically in theory derived rules and not on perception of specific instances. Assumed root, Am7/B: A minor ninth chord without root and with B in the bass. Play (help·info) Am9/B, Am7, then full Am9. In guitar tablature, this may be indicated, "to show you where the root would be," and to assist one with, "align[ing] the chord shape at the appropriate fret," with an assumed root in grey, other notes in white, and a sounded root in black. A comparison of the diminished 7th Play (help·info) and dominant 7th (♭9) Play (help·info) chords. Diminished seventh chord's use in modulation: each assumed root, in parenthesis, may be used as a dominant, tonic, or supertonic. 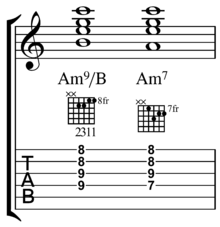 Play ninth chords (help·info) Thus C, taken as dominant, would modulate to F.
An example of an assumed root is the diminished seventh chord, of which a note a major third below the chord is often assumed to be the absent root, making it a ninth chord. The diminished seventh chord affords, "singular facilities for modulation," as it may be notated four ways, to represent four different assumed roots. The fundamental bass (basse fondamentale) is a concept proposed by Jean-Philippe Rameau, derived from the thoroughbass, to notate what would today be called the progression of chord roots rather than the actual lowest note found in the music, the bassline. From this Rameau formed rules for the progression of chords based on the intervals between their roots. Subsequently, music theory has typically treated chordal roots as the defining feature of harmony. Why is it so important to know the root of the chord? Because the roots of the chords will sound whether we want them to or not, whether or not the alphabetical symbol is correct. The root progression which emerges may not coincide with what we think we have written; it may be better or it may be worse; but art does not permit chance. The root progression supports the work. The total root progression is heard as a substantive element, almost like another melody, and it determines the tonal basis of the music. And the tonal basis of a piece is very important to the construction of themes and to the orchestration. Roman numeral analysis may be said to derive from the theory of the fundamental bass, although it does not particularly theorize the succession of roots. The theory of the fundamental bass properly speaking has been revived in the 20th century by Arnold Schoenberg, Yizhak Sadaï and Nicolas Meeùs. ^ a b Wyatt and Schroeder (2002). Hal Leonard Pocket Music Theory, p.80. ISBN 0-634-04771-X. ^ Palmer, Manus, and Lethco (1994). The Complete Book of Scales, Chords, Arpeggios and Cadences, p.6. ISBN 0-7390-0368-2. "The root is the note from which the triad gets its name. The root of a C triad is C."
^ a b Reisberg, Horace (1975). "The Vertical Dimension in Twentieth-Century Music", Aspects of Twentieth-Century Music, p.362-72. Wittlich, Gary (ed.). Englewood Cliffs, New Jersey: Prentice-Hall. ISBN 0-13-049346-5. ^ Joel Lester, "Root-Position and Inverted Triads in Theory around 1600", Journal of the American Musicological Society 27/1 (Spring 1974), pp. 113-116. ^ Joel Lester, op. cit., p. 112. ^ B. Rivera, "The Seventeenth-Century Theory of Triadic Generation and Invertibility and its Application in Contemporaneous Rules of Composition", Music Theory Spectrum, p. 67. ^ B. Rivera, op. cit., p. 66-67. ^ a b Latarski, Don (1999). Ultimate Guitar Chords: First Chords, p.5. ISBN 978-0-7692-8522-1. ^ Chapman, Charles (2004). Rhythm Guitar Tutor: An Essential Guide to Becoming the Consumate [sic] Rhythm Guitarist, p.4. ISBN 978-0-7866-2022-7. ^ John Curwen (1872). The Standard Course of Lessons and Exercises in the Tonic Sol-Fa Method of Teaching Music, p.27. Londong: Tonic Sol-Fa Agency, 8, Warwick Lane, Paternoster Row, E.C. ^ Curwen, John (1881). The new How to observe harmony, p.44. Tonic Sol-Fa Agency. ^ Richard Lawn, Jeffrey L. Hellmer (1996). Jazz: Theory and Practice, p.124. ISBN 0-88284-722-8. ^ a b Adela Harriet Sophia Bagot Wodehouse (1890). A Dictionary of Music and Musicians: (A.D. 1450-1889), p.448. Macmillan and Co., Ltd.
^ Schoenberg, Arnold (1983). Theory of Harmony, 197. ISBN 978-0-520-04944-4. ^ Simon Sechter, Die Grundsätze der musikalischen Komposition, vol. I, Leipzig, 1853. ^ Russo, William (1975). Jazz Composition and Orchestration, p.28. ISBN 0-226-73213-4. ^ A. Schoenberg, Theory of Harmony, op. cit., and Structural Functions of Harmony, ²1969, pp. 6-9 and passim. ^ Y. Sadaï, Harmony in its Systemic and Phenomenological Aspects, Jerusalem, pp. 87-88.